This is a hugely popular and versatile variety and very easy to grow. 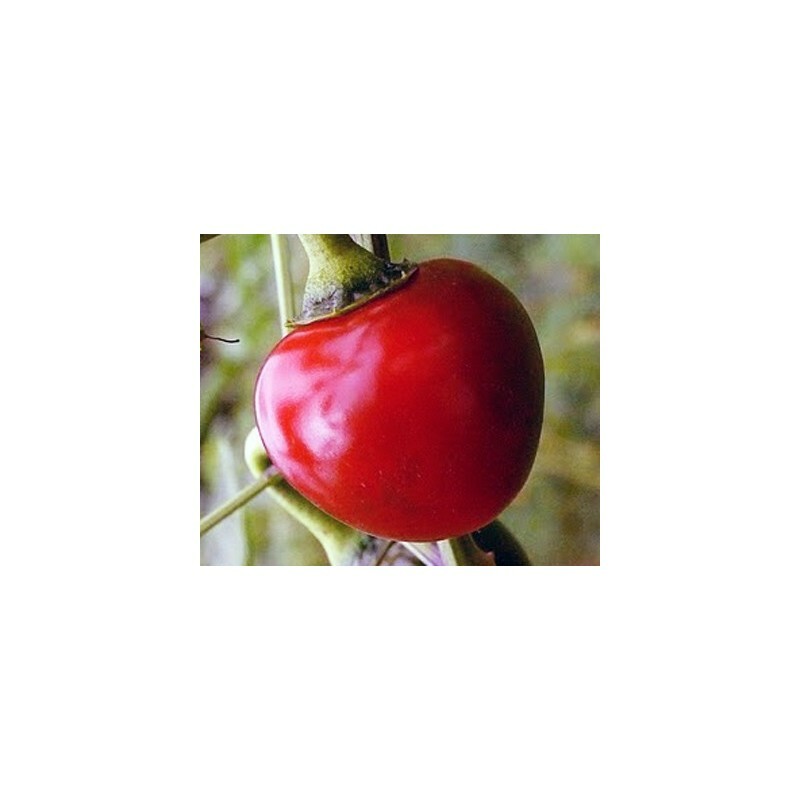 Cherry bomb is ideal to staff with cheese and bake or used for cooking and fresh salsa as the fruits have thick wallls. 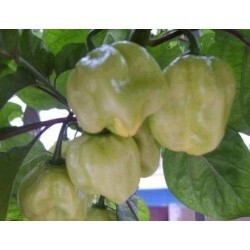 The sturdy plants are quite compact reaching about 60cm in height but they are very productive and are quick to fruit. The fruits are about 5 cm in diameter. 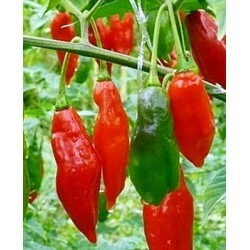 Check out our best selling Cayenne Red chilli seeds too. Adding sand or vermiculite for extra drainage is recommended. It is also usually helpful to add bone meal to seed starting mix to encourage healthy root development. It is ok if there is not much nutrients in this as you will be potting them up. 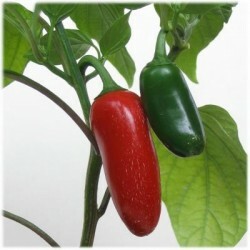 Chilli peppers are a warm growing plant that has a long time to maturity (usually about 70-100 days). This requires that you start them ahead of time in all but tropical climates where they grow like weeds. Pepper seedlings are quite tough and benefit from transplanting so start in a flat to separate out after sprouting. Seeds should be soaked in room temperature water for about 30 mins to soften the seed coat. They should be placed, spaced about ½” at least, on pre moistened soil and covered with approximately 1/8” of potting mix. Water in well. Since chilli peppers are a tropical, warm growing plant, bottom heat will both speed up germination and prevent certain cold related rots. Much like tomatoes, once your chilli pepper plants reach the 3 or 4 leaf stage (the seed leaves plus some true leaves), it is time to transplant them. Take your basic potting mix and add some of your favourite compost and other amendments like blood, kelp or bone meal as directed on the package. 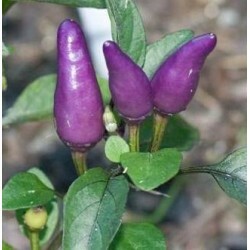 These are quite inexpensive and will really help you have the healthies possible chilli plants. It is also a good idea to add something for a bit of extra drainage as peppers do not like soggy soil. Something like sand or vermiculite. This is best in a 1:3 ratio (sand:soil) for sand and a 1:4 (vermiculite:soil) ratio for vermiculite. Select a 3 or 4 inch pot and fill it all the way with your pre-moistened potting mix. Separate out your seedlings, always pulling them apart from the roots so you do not break the stems. On a pepper plant, anything below the two initial seed leaves will root. So, like tomato seedlings, bury them “up to the ears”, right up to their lowest set of leaves each in their own pot. If you have lots and want to ensure you get at least one in each pot, you can put two and then thin to the strongest in a week or so. Transplanting like this is important as just the seed root system of a pepper is quite weak. Your peppers should be happy in their 3-4” pot until it is time to plant them out, peppers do not get large root systems. Let them dry slightly between watering and provide lots of light. It is a good idea to increase the strength of your fertilizer as the plants grow and you get closer to planting them out as they will use up most of the nutrients in their pots. The lower leaves may yellow, this is perfectly fine and they can be easily removed with a pair of clean scissors or shears. To strengthen them and prevent mold growing, provide air movement if you grow them in the greenhouse just make sure you open the door and window during the day if it gets too humid inside. Once the weather and soil have warmed it is time to prep your chili peppers to be planted outside. Peppers require very warm soil and grow best if night time temperatures are above 10 degrees centigrade, temperatures cooler than this will stunt them almost irreversibly. This process of adjusting you plants to outside is known as hardening off and is meant to slowly adjust your plants to the sun, wind, and difference in humidity and temperature. The basics of this is to put your plants in a sheltered location outside for a couple hours at first and slowly increase the time and exposure they receive. First, be sure your daytime temperatures are above 15 degrees Celsius. Start with partial shade and shelter from all wind for chilies and then slowly expose them to full sun and air movement. This whole process to be able to plant out should take about 5-8 days depending on how drastic of a change you are making. Be sure that the site you are planting is well prepped. Dig the soil well to loosen and aerate it, add compost and other amendments like in the preparation of the transplant soil. It can also be helpful to water the hole before planting if the ground is dry. If your soil does not drain well or your climate is wet, it is a good idea to add sand to your soil or plant your peppers in little hills. Planting in hills is also a great way to ensure the soil the pepper is growing in gets warm enough to get lots of fruit. Peppers hate cold, wet feet. Mulch well to retain moisture as chillies can be quite thirsty plants.